This is an amazing interior decoration solution that will match practically any interior. 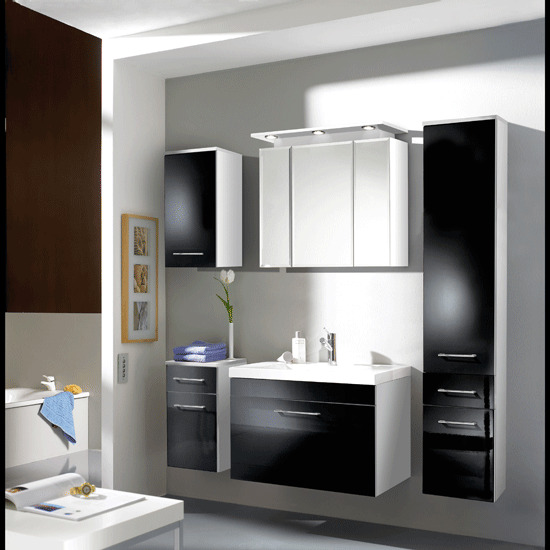 High gloss furniture looks nice in any bathroom, offering you balanced combination of luxury and practical thinking. One of the major reasons why high gloss is so good for a bathroom is because it looks very natural with chrome and metal water taps. And, of course, a diamante inlay creates rich and luxurious feeling. Another great idea is to go with wooden, antique looking furniture. If you home interior features a vintage theme, this is in fact the only suitable idea for you. Sure, wood will be covered with a water resistant finish to ensure your furniture units stay good as new in a high moisture environment. Yet another great example of luxury bathroom furniture is stone and marble range units. Totally resistant to moisture, the furniture is easy to maintain. Perhaps, one of the biggest limitations of going with this solution is that both stone and marble furniture requires quite a lot of space, and will not fit into a standard apartment bathroom. Another great, water resistant example of luxury bathroom furniture is mirrored furniture. This is a functional and stylish solution at the same time. Some units may feature plain mirror design, while others will have stylishly decorated, truly luxurious ornaments on a mirrored surface. One more example of luxury bathroom furniture you might appreciate is soft, padded furniture. It looks very unusual and it creates a truly welcoming and relaxing atmosphere in any bathroom. One of the most common furniture colours is white — one of the best colours that looks logical in the room; however, other shades are also possible. One of the best UK stores that can offer you a lot of stylish luxury bathroom furniture solutions is Furniture in Fashion . This local platform offers one of the best online selections of furniture, varying in styles and designs. In addition, it manages to keep prices affordable, which is a rare thing when it comes to luxury bathroom furniture. And, being a local store exclusively, it ensures urgent delivery to any part of the UK. Even if you order a complete bathroom collection, it will be delivered to you within ten business days maximum. Compact order delivery requires up to three business days, and medium size orders are delivered within five days maximum.